Or as Paul Revere warned, "The Regulars are out!" The first day of the American Revolution is only 6 weeks away. Dr. Joseph Warren, beloved Boston physician, prominent patriot, and committed Sons of Liberty member, arrives at the Old South Meeting House. Dramatically dressed in a symbolic white toga - the attire of a free-born Roman man - Dr. Warren delivers the annual Boston Massacre oration. He speaks about freedom from tyranny - concepts that he learned about while at Boston Latin School and Harvard College. Applause thunders when he finishes, and the Redcoats in attendance are not pleased. The Massachusetts Provincial Congress meets secretly in Concord, Massachusetts with John Hancock and Sam Adams, as the American Revolution looms near. General Thomas Gage, British Governor of Massachusetts, receives orders to destroy the rebel colonists’ stockpiled weapons in Concord. He targets Samuel Adams and John Hancock for arrest. Although Gage strives for secrecy, Patriots observe his every move and communicate with each other through pre-planned codes. “About thirty persons, chiefly North-End mechanics, had agreed to watch the movements of the British soldiers and the Tories, in anticipation of their descent on Concord. These patriots met at the Green Dragon Tavern. We were so careful, that our meetings should be kept secret, that every time we met, every person swore upon the Bible that they (he) would not discover any of our transactions, but to Messrs. Hancock, Drs. Warren and Church, and one or two more leaders. They took turns to watch the soldiers, two by two, by patrolling the streets all night." Note that the action takes place at the Green Dragon Tavern, once such a popular meeting place for the Sons of Liberty that the still-popular watering hole now calls itself the "Headquarters of the American Revolution." 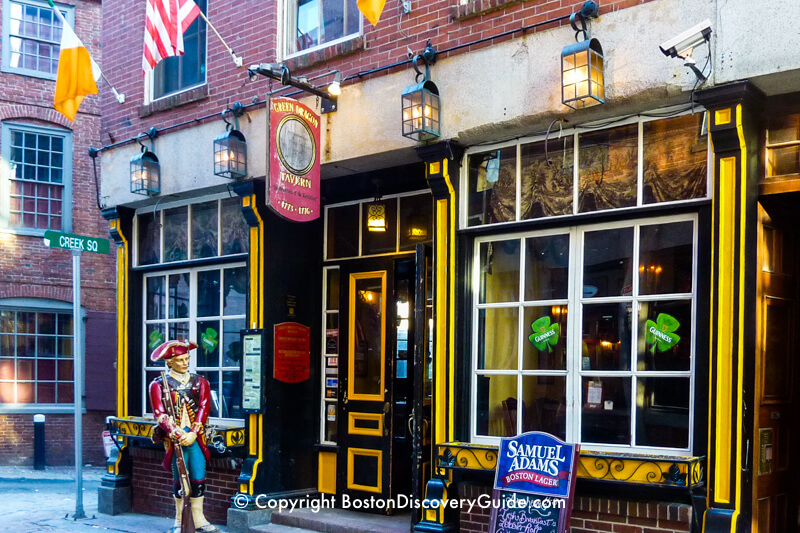 If you're visiting Boston, stop by this historic Boston tavern for a pint (which qualifies you to tell your friends back home about how you soaked up Boston history). Dr. Joseph Warren asks Paul Revere to prepare to go to Lexington to warn Hancock and Adams if the British start marching west to arrest them. 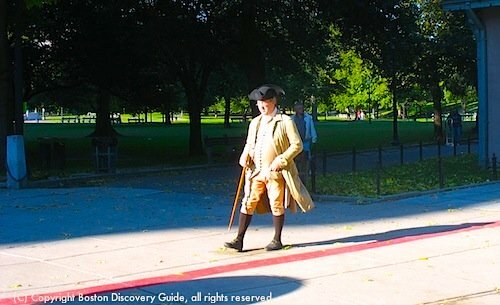 Revere has been working as an express rider for the Boston Committee of Correspondence and the Massachusetts Committee of Safety since 1774 and is accustomed to carrying news, messages, and copies of resolutions for the independence movement leading up to the American Revolution. A friend who is sexton in Christ Church - now called Old North Church - in Boston's North End will hang lanterns as a secret sign. This is actually a back-up signal to the local Sons of Liberty in case the British prevent him from leaving Boston. At 8 PM, under dark skies, 700 British Regulars who had been camping on Boston Common board boats and barges on Round Marsh, the part of Back Bay that covers the area where Boston's Public Garden is located today. 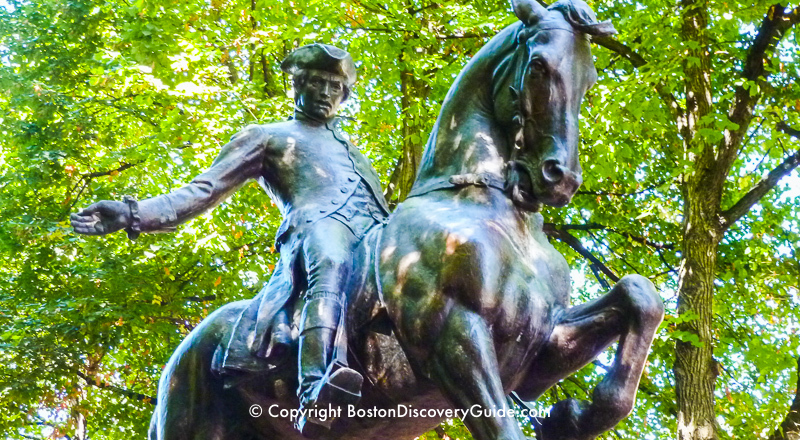 Dr. Warren tells Paul Revere and William Dawes to ride to Lexington to alert Hancock and Adams. Revere observes two lanterns shining through the windows in Christ Church and confirms with friends that the Sons of Liberty have seen this signal about the British route. Taking separate paths at first and then meeting at Lexington, they deliver their message. Then, going on the assumption that British commanders wouldn't sent 700 troops just to arrest two men, they realize the Redcoats must have more in their sights than just 2 dissident Colonials, and are in fact probably headed to Concord to seize the munitions. Joined by a third patriot, Dr. Samuel Prescott, they agree to ride on to Concord, stopping at every farmhouse along with way with their alert. This paves the way for the surprise that the British will get the following day - their first inkling that an American Revolution is underway. In "The Midnight Ride of Paul Revere" by Henry Wadsworth Longfellow, we now remember Revere's alert as “The British are coming!” And because Longfellow mentions only Revere in his poem, we tend to forget that Dawes and Prescott also spread the warning. Under the command of Colonel Francis Smith, the British Regulars begin the 18 mile to Concord, not knowing that their movements have been observed, an alert is going out across the countryside, and Militia and Minutemen are gathering. Around 5 AM, Colonel Smith and his troops are crossing Lexington Green when they spot a group of 50 Militiamen, not in uniform but carrying a variety of weapons, some of them decades old. The British order them to disperse, but they don’t obey. A shot rings out. No one knows which side fired first. The Redcoats shoot into the group of Militia, killing 8 and leaving 10 wounded. Although the British press on to Concord, the Battle at Lexington Green slows them down. By the time they finally reach Concord and start searching for the munitions across the countryside, Minutemen and Militia from nearby communities begin to surround them. The American Revolution officially begins. The battle at the bridge turns into a rout. Having found no munitions and failing to capture Hancock and Adams (who, thanks to Revere and Dawes, are miles away and safe), the British decide to retreat to Lexington, 6 miles from Concord. And then . . . the real battle starts. 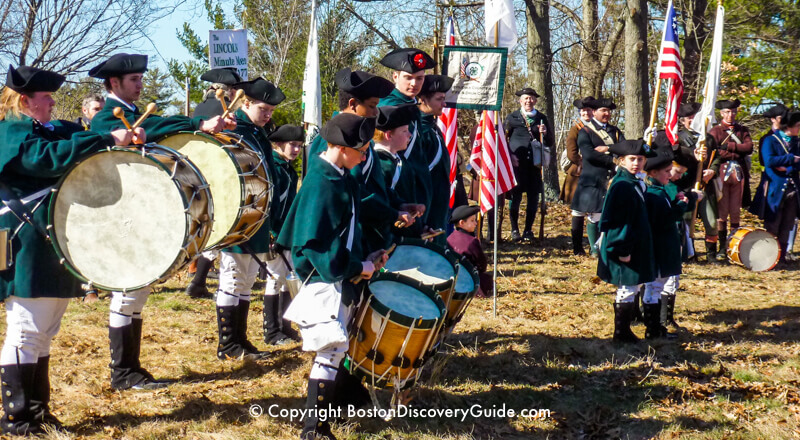 Militia and Minutemen from nearby towns start marching toward Concord and converge upon the retreating Redcoats. Now remember, the Colonists are untrained in British military procedures. Not surprisingly, they don’t form an offensive line, which is the easy target that the British expect. And as a result, the Redcoats don’t know where to fire! Instead, the Patriots divide up into small attack squads and hide behind walls and trees as they shoot the readily-visible Redcoats. This tactic - and the deadly results - so unnerves the British that they break ranks and scramble back to Lexington. At that point, British General Huge Percy arrives with 1,400 reinforcements, who disperse the Patriots with cannons. General Percy reassembles the British troops into regiments for the retreat back to Boston. Along the way, the British encounter the old men and women of Menotomy (now Arlington), left behind when the younger men joined the Militia. The resulting battles are the bloodiest and deadliest of the day. Prior to April 19th, most British officers believed, as one wrote, that the colonists were “cowardly and would never fight the Crown.” The fighting on that day, by fierce patriots like 81-year-old Samuel Whittemore of Menotomy, changes their minds. Technically, the Siege of Boston begins the day before, on April 19th. As the British troops fight their way back to the city after finding themselves outnumbered in Concord, the American militia follow them as far as Boston Neck - the narrow strip of land connecting the Boston peninsula with the mainland. 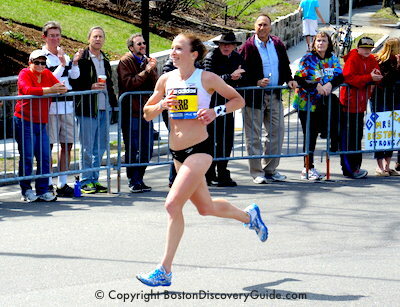 By remaining on Boston Neck, the Americans basically trap the Redcoats in Boston. The British find themselves, along with the rest of the city, under siege and the Revolutionary War begins in earnest. Prior to the battles in Lexington, Concord, and Menotomy, only about a third of the colonists believed in breaking with Britain. Perhaps another third felt true loyalty to the Crown. The rest were either indifferent or felt that while some change might be desirable, the Sons of Liberty spent far too much time in the local taverns to be credible as revolutionaries. Now, however, the Patriots use the recent bloodshed during battle to inflame public opinion and convince a larger number of the population to support their cause. With the British trapped in the city, the patriots can build up their forces. The Massachusetts Militia, under General Artemas Ward, sets up positions in Cambridge, Charlestown Neck, Roxbury, and Dorchester Heights. 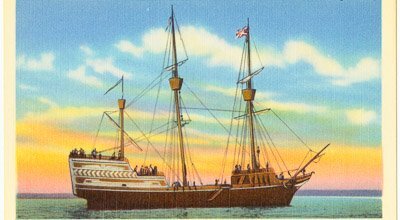 Although the British do control Boston Harbor and can get supplies and troop reinforcements in by water, they have little access about what's happening on land. The British receive about 4,500 more troops plus 3 generals, and make plans to break out of the city. The Massachusetts Committee of Safety learns that the British plan to attack Dorchester Heights and Charlestown. Colonel William Prescott is assigned to fortify Charlestown. About 1,200 colonists occupy Breed’s Hill in Charlestown in order to protect the Charlestown shipyard in Boston Harbor. Leading about 2,400 troops, British Major General William Howe attacks the next day. The colonists withstand three assaults until they run out of ammunition, and then retreat quickly. Although the Redcoats eventually manage to take the hill, they suffer heavy losses - about 1,000 killed and wounded. Furthermore, although they have the hill, that's all they have - the colonist still occupy the lower ground around the peninsula. The colonists, who are told, as their ammunition runs low, “Don’t fire until you see the whites of their eyes," suffer lighter casualties, with about 400 dead and wounded. With nearby townspeople joining in the battle, as many as 3,000 - 5,000 colonists are believed to have participated in these battles. Sadly, those killed include Dr. Joseph Warren, believed to have been a marked man ever since his Boston Massacre oration angered the British three months earlier. 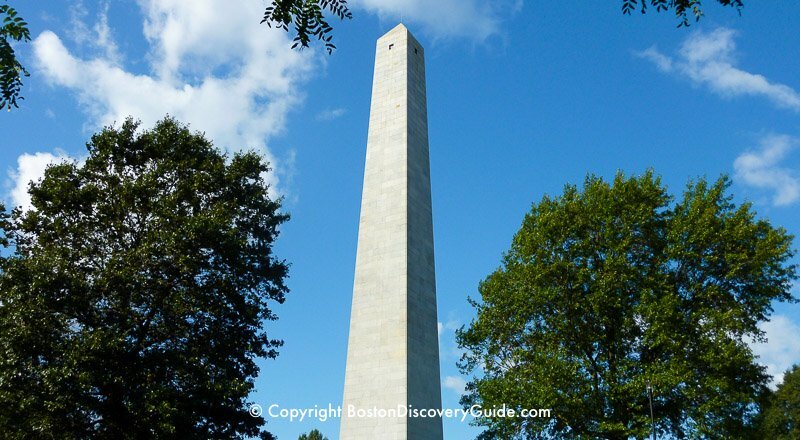 Bostonians remember the encounter as the Battle of Bunker Hill – despite its location on Breed’s Hill, about half a mile to the west. Trapped in Boston by the Siege, British soldiers tear down the North End's Second Church, built in 1648. They rip out the pews of the Puritan place of worship and site of so many impassioned speeches promoting liberty, the Old South Meeting House, and use it an an indoor riding rink for their officers' horses. With tensions running high on both sides, the patriots take advantage of the siege to build up their forces. Barricaded in Boston, the British watch helplessly as the American Revolution spreads across the colonies.